Strengthen learners' grasp of the most challenging units and develop the skills required for success with this essential student book mapped to the Cambridge National Level 1 / 2 in Creative iMedia. Covering the mandatory and optional units, this textbook will help to build knowledge, reinforce classroom learning and test the students' understanding. * Builds students' knowledge with clearly-focused content to aid progression and activities to assess understanding. * Prepares your students for both internal and external assessment with opportunities to test and consolidate understanding. 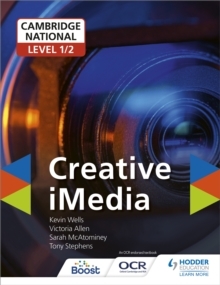 * Support your students' progress through the course with the only textbook published for the Cambridge National Level 1 /2 in Creative iMedia.